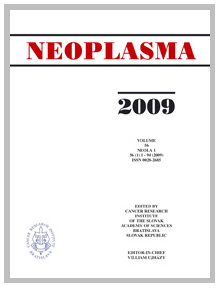 The journal Neoplasma publishes articles on experimental and clinical oncology and cancer epidemiology. Only original articles are accepted which have not been published elsewhere. Minireviews and book reviews are also published. “Case report” articles are not published. Manuscripts should be submitted to the publishing system https://mmplus.sav.sk/. Title page should include the title of article, authors (initials of the first and middle names, without academic degrees) and affiliations. Indicate the author responsible for the correspondence and provide his/her address, zip code, and e-mail address. Give a?running title, not exceeding 60 keystrokes, and provide minimum of 3 and maximum of 6 key words suitable for indexing. If there are numerous abbreviations within manuscript, their explanation should appear at the bottom of the page. The non-structured Abstract should describe in short the main problem, methods, results and discussion. Text of the article should be subdivided into Introduction, Materials and methods (Patients and methods for clinical articles), Results, Discussion, Acknowledgements, References and Figure legends. References should be numbered consecutively in the order in which they are first mentioned in the text. For citation in the text the numbers of the appropriate references should be referred in square brackets, comma separated. Abbreviations should be kept a?minimum and defined upon first use in the text (except of those which are very common). Authors will only use internationally accepted nomenclature (chemical compounds, enzymes, measures in SI units). The bibliography must give the names of the first 5 authors (with initials, followed by “et al.”), title of article, name of journal (quotations using international abbreviations), year, volume, first and last page numbers. For book references, give name(s) of author(s), title of article, editors of book, title of book, city, publisher, year and pages. Any references to unpublished work (unpublished data, personal communication, etc.) should be made in the text only. Figure legends should have a?short title of 15 words or less. The full legend should have a?description of the figure and allow readers to understand the figure without referring to the text. Tables should be included at the end of the manuscript. All tables should have a?concise title. Footnotes can be used to explain abbreviations and placed below the table. BTASSO R, AUGELLO A, CARIDA M, POSTIGLIONE F, TIBILETTI MG et al. Development of sarcoma in mice implanted with mesenchymal stem cells seeded onto bioscaffolds. Carcinogenesis 2009; 30: 150–157. BLAIR A, STEWART PA, HOOVER RN Mortality from lung cancer among workers employed in formaldehyde industries. Am J?Ind Med 1990; 17: 683–699. LI J, ZHANG N, SONG LB, LIAO WT, JIANG, LL. et al. Astrocyte elevated gene-1 is a?novel prognostic marker for breast cancer progression and overall patient survival. Clin Cancer Res 2008; 14: 3319–3326. Diener HC, Wilkinson M, editors. Drug-induced headache. New York: Springer Verlag, 1988. Tables should be part of the manuscript document. You can use tables created in your word processing software with table tools or insert them as embedded object from spreadsheet software. Tables must be editable – do not insert tables into manuscript as images. Tables larger than one printed page can be published as supplementary file. Figure files for graphs, diagrams, lineart work as well as photographic type of images use following file formats: jpg, jpeg, tif, tiff. Each figure should be submitted as a separate file. The minimum acceptable resolution for all figures is 300 dpi (at least) at the desired print size. The size of figures: 84 mm (one column width) or 173 mm (two columns width), max figure height: 205 mm. When your graphs should be reduced to the size of a single column, the smallest type size on the figure must be at least 2 mm and all symbols must be discernible. DO NOT insert charts created in spreadsheet softwares into the manuscript text file either as embedded objects or as images. When you are using specialized software to create your charts, graphs, diagrams please upload them as high resolution images (300 dpi at least). For graphs, diagrams, lineart work as well as for photographic type images use tif (LZW compressed) or jpeg format of files. Multipanel composite figures (labeled A, B, C, etc.) should be assembled into a single figure that fits on one page (two column width) and should be provided as a single file. Any figure submitted in color will be reviewed and processed with the understanding that the figure will be published in color. If you do not intend for your figure to appear in color in the printed version of journal, please ensure that you submit an additional black and white version for printing purposes. The manuscript should be submitted in English. The editor holds the right to determine the suitability of translations and to make minor linguistic corrections, if necessary. Authors are responsible for more substantive linguistic corrections. The manuscript so approved is considered final, and no further changes (except in the galley proof) will be accepted. The cost of each page with color figures is Euro 120,-. Authors may submit their manuscript (with tables embedded in main document file) in following formats: doc, docx, odt or rtf format. Supplementary information files should be submitted as separate files in any of the following formats (in the most appropriate one to the information displayed): doc, docx, odt, txt, xls, xlsx, pdf, ppt, jpg, jpeg, tif and tiff. Supplementary information will be published only in electronic version. Copyright: By submitting a manuscript, the authors agree that the copyright of their article is transferred to the publishers if and when the article is accepted for publication. Requests for reproduction should be sent to the publishers.